Terror Behind the Walls at Eastern State Penitentiary. The Philadelphia area is home to some of the country's scariest haunted attractions. But you don't want to go home immediately after your scare, right? We've compiled a list of locations where you can go before or after your trips through the haunted houses, including spots for pizza with the kids and bars where you can stock up on liquid courage. 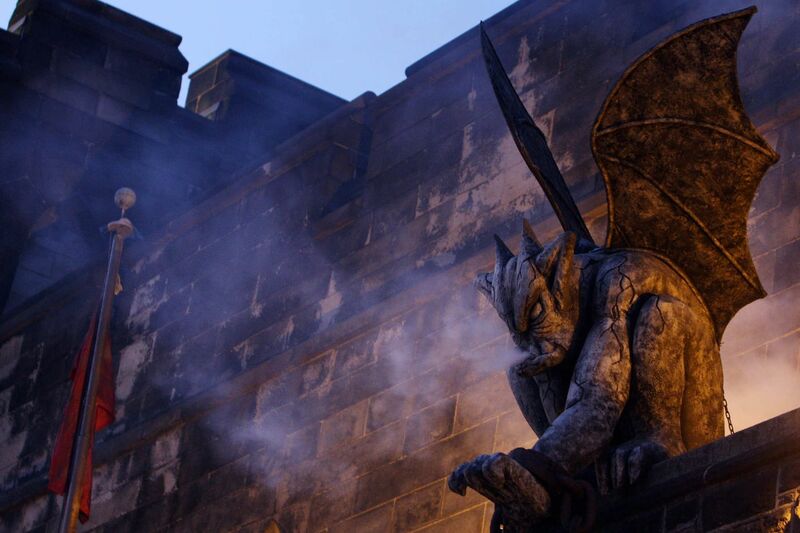 Terror Behind the Walls is one of Philly's most famous and well-visited Halloween attractions and there are plenty of food and drink options in Fairmount. London Grill (2301 Fairmount Ave., 215-978-4545, londongrill.com) is offering a Halloween-themed three-course dinner, which includes menu items like Witch's Brew soup of the day and Grilled Headless Chicken and Brie, along with a ticket including expedited entry to Terror Behind the Walls for $45 to $55. There's a kids menu as well. Jack's Firehouse (2130 Fairmount Ave., 215-232-9000, jacksfirehouse.com) is also offering a similar three-course menu with Texas Chainsaw Massacre pulled pork and mummified salmon, which also includes a ticket to the attraction with instant access. You must call for reservations. The Bishop's Collar (2349 Fairmount Ave., 215-765-1616, thecollar.us) and Urban Saloon (2120 Fairmount Ave., 215-232-5359, urbansaloon.com) both serve up typical bar grub alongside an extensive beer list. After you visit this South Philly haunted house, hit up Pub on Wolf (2301 S. Front St., 215-271-1556) for drink specials and a game of pool, or Anthony's Saloon (2351 S. Front St., 215-468-5222) for crabs, if they're available, and cold brews. For a bite, try The Wild Burrito (2015 E. Moyamensing Ave., 215-336-9453, thewildburrito.net) for Mexican fare or Terryin (358 Snyder Ave., 215-218-2888, terryinphilly.com) for sushi. Randy Bates, the farmer and owner of the Bates Motel Haunted Hayride. If you're driving to Arasapha Farm to indulge in its haunted attractions, you might as well make a trip out of it. During the day, the farm has hayrides, a corn maze, a pick-your-own-pumpkin patch, duck races, and a petting zoo. There's also a concession stand if you get hungry. After your trip through the hayride and motel, check out Duffer's Tavern (192 PA-352, Glen Mills, 610-358-5050, dufferspa.com/tavern) for drinks and bar snacks. If you're feeling fancy, La Porta Ristorante (1192 Middletown Rd., Media, 610-358-5104, laportarestaurant.com) has classic Italian offerings such as chicken piccata and frutti di mare. The historic institution is in Spring City, which is about an hour-long drive north of Philly. Try Latin Corner (13 Riverside Dr., Spring City, 610-948-3207) for cheap, authentic Puerto Rican food like Cuban sandwiches and beef stew with yellow rice. Giovanni's Pizza & Restaurant (466 Main St., Royersford, 610-948-3693) on the other side of the Schuylkill also serves up authentic Sicilian pies topped with ricotta, basil, and prosciutto. The Valley of Fear boasts four attractions — a haunted hayride, a zombie maze, a haunted forest trail, and a zombie escape adventure — this year. After you’ve gotten your dose of fear, head over to Santorini Gyro (928 Bustleton Pike, Feasterville, 215-494-9498) for affordable Greek bites, Jersey’s Tomato Pies & Bistro (295 Buck Road, Southampton, 215-396-1000, jerseystomatopie.com) for family-style pizzas, or Peng Yuan (295 Buck Road #307, Holland, 215-953-1838) for Chinese food. Besides its haunted attractions, Shady Brook Farm also offers a farm market, a garden market where you can get plants, a corn maze, pumpkin patches and more, so head out there early to check out its harvest offerings. For dinner, Venezia Pizza (672 Stony Hill Rd., Yardley, 215-321-3333, veneziapizza.com) offers thin-crust pizzas while Indian Garden (676 Stony Hill Rd., Yardley, 215-369-7016, indiangardenyardley.com) offers favorites like chicken vindaloo and lamb rogan josh. After you wrap up your trip to one of Bucks County’s most popular haunted houses, stick around for bonfires and beverages on-site. If you’re hungry, visit Jules Thin Crust (78 S. Main St., Doylestown, 215-345-8565, julesthincrust.com) in Doylestown for organic pizzas, Green Parrot (240 N. Sycamore St., Newtown, 215-504-7277, greenparrotrestaurant.com) for sports games and beers, or KO Modern Korean Cuisine (2817 S. Eagle Road, Newtown, 215-860-5515, eatko.com) for kimchi stew and bulgogi. Night of Terror is New Jersey's largest and scariest attraction, including multiple experiences such as a haunted paintball hayride. If you head out there a little early, you can check out Hill Creek Farms (1631 NJ-45, Mullica Hill, N.J., 856-223-0028, hillcreekfarms.com) right across the road for apple cider doughnuts and pumpkin picking. Afterward, head to Mandarin Oriental (141 Bridgeton Pike, Mullica Hill, N.J., 856-223-8639, themandaringroup.com) for sushi or Chianti Italian Restaurant (127 Bridgeton Pike, Mullica Hill, N.J., 856-478-4400, chiantirestaurantnj.com) for pastas and other Italian dishes.